BRDC motor racing guide for new drivers in the1950s. Homepage. This page: Do's and Don'ts for the driver new to motor racing, 1950s-style. A Start For Finishers, by the BRDC. The BRDC, or British Racing Drivers' Club, was officially formed in 1928 and has continued ever since, its membership largely comprising of drivers who have found success in motorsport both in Britain and also in further flung corners of the Commonwealth. Its present-day membership numbers around 800 or so, and since 1971 the club has owned the Silverstone racing circuit. The pamphlet featured below dates to the mid/late 1950s, judging by the front-engined racing car illustration on its cover. 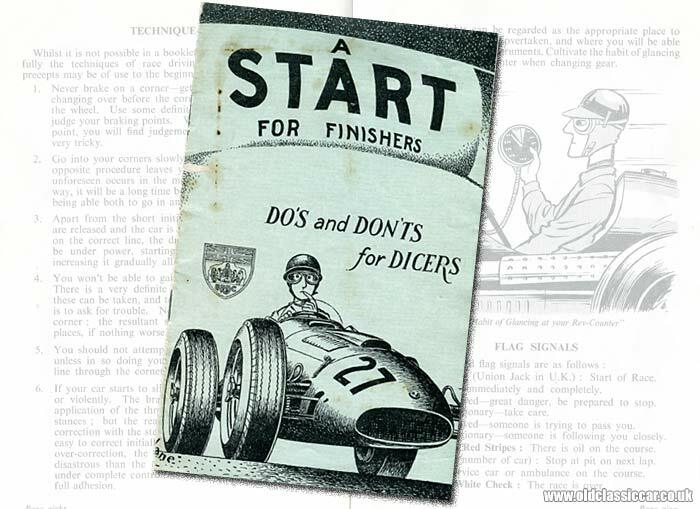 Titled "A Start For Finishers", the leaflet was produced by the BRDC as a guide to motor racing for drivers new to the sport. The British Racing Drivers' Club has realised for some time that it is not very easy for a driver taking up motor racing to assimilate all the various points which may make all the difference between success and failure. The Club has, therefore, produced this little booklet in the hopes that anyone starting racing for the first time may find it interesting and helpful. The points in it are the result of experience gained by many well-known drivers over the years. It is hoped so much that it will be read, and not only read but treated seriously, for it is an earnest attempt on the part of the Club to be helpful to those who, perhaps, have never taken part in a motor race before. Even drivers of experience may find points in it which may give rise to discussion. For my own part, I would say good luck and the very best of all possible good wishes to all who read it. Excluding the covers, this lightweight publication runs to just twelve printed ages, and included are tips on car preparation, driving standards, on-track etiquette, technique, and regulations that surround the sport. While this was written 55-60 years or so ago, much of what it contains is as relevant to drivers now as it was then, and no doubt similar publications are still being printed by race organisers and clubs keen to see drivers acting in a safe and responsible manner on the circuit. Several of the points outlined under "General Principles" follow, as examples of the BRDC's expectations of the new driver. Your name (in all probability) is not Nuvolari. Please do not enter your first race with the idea of proving yourself a genius overnight. It took even the great Tazio years of practice before he became acknowledged as "il maestro". Motor racing is not only dangerous - it is also expensive. However keen you are to race, don't start until you can really afford it. Apart from the danger of racing a car prepared and perhaps even built "on a shoestring", don't forget that to put right a blow-up or prang may cost far more than you can afford. Do you know exactly what it feels like to drive at racing speeds? If you can truthfully answer "Yes" you are probably due for an early demise; nobody in his right mind drives at racing speeds on the public roads. Try to get in some practice on a closed circuit before the day of your first race. When you are in a race, don't try to dice with the fast boys - in fact, don't try to dice at all. Better by far to finish at the back than on your back. Remember that any attempt by you to outcorner the experts will end only in disaster. Remember that your primary object is to finish your race. To win it is essential to finish: to finish it is essential to stay on the road. It is far better to go steadily and gain experience than to try vainly to emulate the champions, probably ending up either in a ditch or with a rod through the side. There then follows advice on driving technique, for instance never braking in the middle of a corner, entering corners slowly (relatively) and exiting them fast, thoughts on handling a slide, and guidance on where it's advisable and inadvisable to attempt an overtaking move. Again this was aimed at beginners by and large, but it gives some useful insight into images of yesteryear's drivers, all arms and elbows, fighting to keep their narrow-tyred front-engined projectiles on the circuit, and away from the straw bales and marshal posts. BRAKES. Sports car drivers will have to demonstrate that their brakes will lock all four wheels evenly. TYRES. Worn or otherwise faulty tyres will result in immediate exclusion. Retreaded tyres may only be used on sports and touring cars which may not reasonably be expected to exceed 100mph on the particular circuit concerned. STEERING. There should be a minimum of play at the rim of the steering wheel, and in the kingpins. Tightness of ball jonts may also be checked. SUSPENSION. Pivots may be checked, and links should be clean to allow examination for cracks. NUMBERS. Your numbers must be legible: this is your responsibility, and if, through poor numbering, your are missed by the timekeepers, you will be held entirely to blame. GENERAL. All parts of the bodywork must be securely fixed, whilst no scrutineer will pass a car which is likely to leak oil on the road. Attention will also be paid to the fireproof bulkhead between engine and cockpit. Some people's interpretations of the word "fireproof" seem a little elastic! Note that the regulations for some sports car races stipulate that a fire extinguisher must be carried on the competing car. Take a pride in the turnout not only of the bodywork but also of the engine, chassis, etc. A clean car always gives a good impression, but excessive dirt immediately casts suspicion on the condition of the car. The axiom "What looks right is right" is never truer than in motor racing. Don't present your car for inspection while there are still "jobs to be finished", and do try to be present yourself: you may be needed, and anyway it isn't fair just to leave it to your mechanics. I'd be interested to know whether this booklet has any earlier incarnations, or if this was the first of its type to be compiled and distributed by the BRDC? The modern-day goings-on of this august institution may be found on the BRDC's website. More period items relating to motoring can be found in the Motoring Collectables section of oldclassiccar.co.uk. Pages and articles that specifically relate to motor racing in years gone by, can be found on this page.